"I suppose I have to wait until, inevitably, Shimano brings out a smaller, lighter 9 or 10-speed competitor and actually gets it into bikes in shops. Hope I am not too old to enjoy it then." Well, things seem to be progressing further & faster than expected. 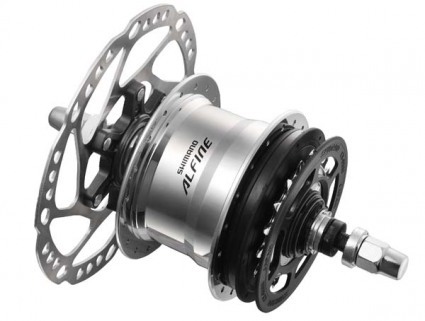 Although I only noticed it recently, there was a flurry of information on internet around 2 Feb 2010, about Shimano's future 11-speed Alfine hub. Release date – September 2010? I borrowed the heading picture from Hubstripping – Thanks! In fact, apart from the £350, it sounds almost perfect! The proposed trigger operation may be a bit slower than a twistgrip for clicking back down from 11 to 1 for a restart? By the way – did you see that bit of the Tour de France, where Yellow Jersey missed his derailleur gearchange & his chain came off? They seemed to think the others should have stopped & waited while he put his chain back on.